(Helium required upon arrival) Simply take them to your local floral shop and have them inflated prior to release. 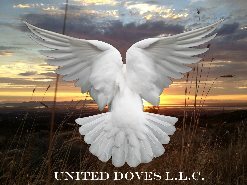 A beautiful unique alternative to having Live White Doves released at your special event for our areas that do not yet have a representative available to assist. 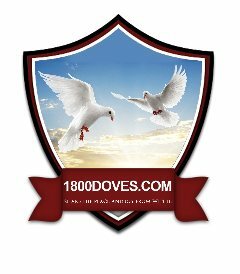 These are just as spectacular as the real doves that are traditionally released. 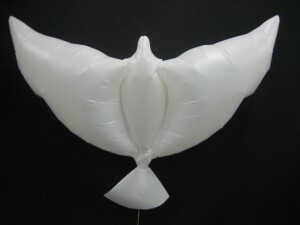 Our Exclusive White Balloon Doves can be released anywhere within the USA!!! Day or Night Time! These are extremely convenient and affordable on the price too. They arrive NON-INFLATED (without helium) to save on shipping fees, so you'll simply need to take them to your local floral shop to have them filled up. The exclusive unique wing design construction makes these balloons actually look like they are flying in mid air as they ascend into the sky. All orders are shipped USPS EXPRESS and Guaranteed to Arrive on Time. A minimum 4 day advance notification is required to ensure these can get delivered on the expected day. These balloons are (Eco-Friendly) for the environment, and have a special effect once released. They are made from a safe biodegradable material, and can be easily incorporated into any special event. Each order shipped will also receive a complimentary poem traditionally read with Live Bird Releases. This inspirational poem provided can be read prior to releasing the White Balloon Doves. Order your White Balloon Doves Today and make your event unforgettable!